A composer pal emailed me not long ago to express delight in seeing our friend, guitarist Sharon Isbin, on an episode of a popular Showtime drama series. She went on to marvel at the subsequent spike in sales of Sharon's CDs, having assumed that since her appearance wasn't, after all, on a music show, that the TV watching audience would somehow lack interest in Sharon's music-making. My gleeful response was that as I see it, the only separation between listeners and music is that which exists due to our self-limiting perceptions. Here's a rather counter-intuitive idea to squeeze into: the more artists refuse to consider differences in target audiences, the more successful we'll be! Hey, that sounds pretty radical, huh? It completely flies in the face of the way things are currently set up, whereby radio stations [read: advertisers] strap themselves into a demographic straight-jacket. And, let's be frank here, it's mostly our fellow musicians on the inside of a happy musical tunnel who happen to know what's coming down the tracks in concerts, recordings and the like. Admit it: composers tend to see the same type of people at the same concerts and then shake our heads wondering why larger numbers of new people aren't there. Duuhh! Just as I don't have a clue when the next forensic science lecture is, so it is for the criminologist who has no idea about any of our events. Yet. Doesn't virtually every human like music? I'm not surprised in the least that Sharon's sales would zoom after such a mass media appearance. And it's especially wonderful and significant that an artist of her caliber participated in something mainstream like a TV show that has little or nothing to do with music. This is what composers all need to be doing far more of: integrating ourselves into the society in which we live, and making ourselves RELEVANT to our neighbors! We've got to earn the interest of our audiences and find ways to reach them and to be seen as part of the fabric of our culture, rather than the fancy-schmancy gold thread that no one can afford to buy that we would like to see stitch that fabric together. That's not reality. Or it is, but only to an aging, wealthy population which less and less reflects who our society and its media consumers actually are. I'm a real outside-the-box kinda gal, and I believe that in addition to the usual [and important] routes composers use in promoting their work within a predictable community, like Sharon, we need to explore ways to get noticed in lots of non-music markets. Let's see, I used to have a penchant for raising and breeding pythons, and years ago had a writhing collection of about 50 beautiful snakes, lizards and frogs. Maybe there should be some articles about me in Reptile World? Herpetologists like music. 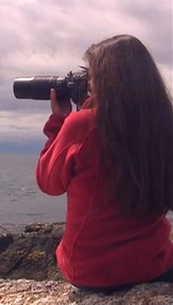 I live part time on a sailboat and love coming nose to snout with sea life on my kayak or paddleboard; perhaps there are sailors and marine biologists who would enjoy being out on the ocean with some of my music playing on their iPod? Water lovers like music. With all the time I spend tending to my snazzy little project studio, electronic and stereo gear mags oughtta write about my CDs. Soldering experts like music. And I think the beer makers of America might be quite interested in my latest offerings, if only they knew what a fine sponsor of their product I can be on occasion. People who belch like music! Oooh, this is so easy. I'm off to call a publicist. It is 3 in the morning, and this, the middle of my best working hours, finds me beating perfectly innocent notes into submission so that Sibelius (the notation program, not the summoned muse) might cause them to appear even more worthy than they in fact may truly be. 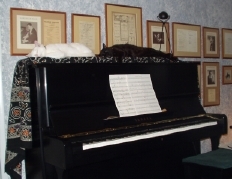 Behind my writing desk is a piano, and flanking me here in my studio are two wonderful, human-oriented adopted stray cats who happen to reflect the keyboard: one black, the other white (no, I did not name them Ebony and Ivory). The white one is young enough to still have a penchant for getting into and onto things that will hardly seem worth the effort in a couple more years. One of those objects happens to be my piano, on which all four of his paws have just landed. Loudly. I could not have asked for better material with which to begin. And at the time, strained head-holding and all, I obviously wasn't coming up with any, either. Thanks to my cat, off I went on a happy musical adventure. And ever since then, including just a few moments ago tonight, when he lands on the keys on his way to his own happy adventures, I always listen. In this age of marketing, the titles composers choose serve to draw listeners to a piece, even more than to describe it. In a way, the title is the only advertisement our pieces have. When I began composing a lot of chamber music, I sought some sort of youthful legitimacy in the Big Concert Music World by using standard, traditional titles: "Sonata for...." Trio for... " etc. The music to the pieces themselves had no particular meaning, other than whatever I might have attributed in their program notes. Later I became more of a story-teller, and used openly programmatic titles and descriptions that almost forcibly dictated to the audience what they would hear (I'm going to grab you by the neck and tell you a story, dammit!). These days I'm more interested in taking people on the journey of their choosing, with provocative titles that are less clear as to a certain meaning. I haven't perceived any difference in the ratio of the number of performances or recordings of pieces in any of these three categories, but people do comment on and remember the more catchy titles, as I do for a lot of new pieces I enjoy. Human nature, I guess. Last week, the chamber music series commissioning a quartet that premieres in the way-distant future of nine months from now, asked me for a title for their spiffy flyer and poster. I can't even imagine what I'm having for dinner tomorrow, much less think of a good moniker for this still-mythical piece. Oh, how I would have loved to have something! It occurred to me that the Title Police would probably not arrest me, should I list one title and in fact use another months later. I mean, honestly, which ticket buyers would notice? Surely they have more important things to do in their lives than track title inconsistencies. At least most of them. But in the end I chickened out and simply had the series list the generic "Work for flute, violin, cello and piano" as a slot-holder. Boorrring! And when I see that nice flyer in my mailbox not long from now, I already know from past experience that I will have two simultaneous reactions. The first will be the initial pang of "gee, I guess it's real." The second pang is that of sheer panic and near horror, seeing an announcement about my unwritten premiere committed to print and mailed to thousands of people. My shiny new music will be performed by specific people on a specific night, and does not yet even exist! Wow, I sure hope I come up with something good. Such advance promotion is one of the intimidating parts of the job. This titling thing can be daunting. It's a little like giving a name to a newborn, in that you're sticking them with something they'll carry around for the rest of their life (if only on every legal document they must suffer through). Maybe I should just name my next piece Joe.